The NOAA/AOML XBT (eXpendable BathyThermograph) Network consists of transects across all ocean basins where XBT are used to collect temperature observations of the upper 1km of the ocean. The XBTs are deployed from research vessels and ships of the Ship Of Opportunity Program (SOOP). The transects are sampled in two modes: High Density and Frequently Repeated. All XBT transects are reviewed through an international consortium with oversight by the SOOP Implementation Panel (SOOPIP). Several XBT transects are providing some of the longest time series in existence used to monitor ocean properties. An eXpendable BathyThermograph (XBT) is a probe that is deployed from a ship and measures the temperature as it falls through the water. A very thin wire transmits the temperature data to the ship where it is recorded for later analysis. The probe is designed to fall at a known rate, so that the depth of the probe can be inferred from the time since it was launched. Approximately 20,000 XBTs are deployed annually by the scientific and operational communities. After having been deployed, data collected from XBTs are transmitted in real-time to data distribution centers (e.g. The Global Telecommunication System) and these data are used for scientific analysis (www.aoml.noaa.gov/phod/goos/xbtscience) and for assimilation in numerical ocean, weather, climate, and ecosystem models. The earliest XBT observations date from 1980's and more than 2 million XBTs have been deployed to-date. The NOAA/AOML XBT (eXpendable BathyThermograph) Network is designed to measure the upper ocean thermal structure in regions with the objective of investigating the temporal variability of key global surface and subsurface currents and of meridional heat transport in the Atlantic Ocean. XBT transects in HD mode are repeated approximately every three months with XBTs deployed 10km to 35km apart, in order to measure the mesoscale structure of the ocean and to assess the ocean circulation responsible for redistributing heat and other water properties globally. HD XBT transects are carried out globally with AOML taking the lead in most of the operations in the Atlantic Ocean. 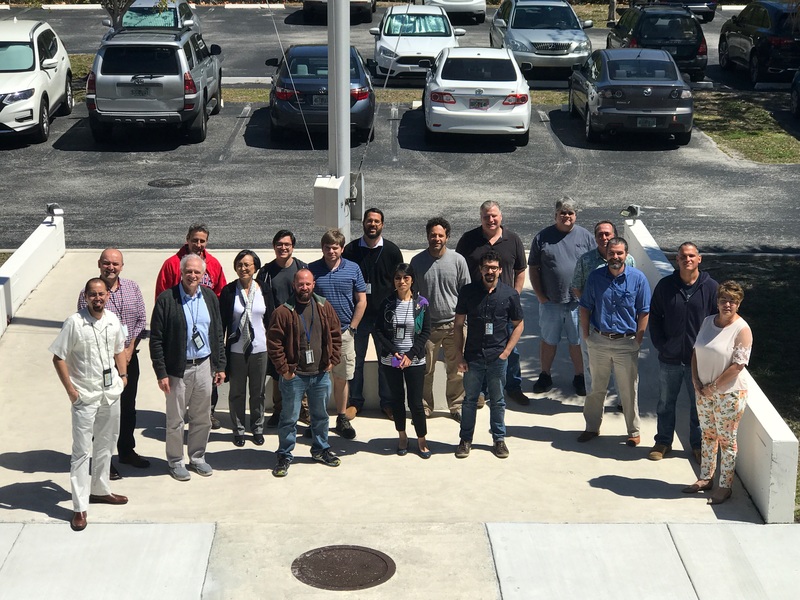 In order to accomplish all operations, from instrument development, probe deployments, and data management, AOML with academic and government institutions in Argentina, Australia, Brazil, China, France, Germany, Italy, Japan, South Africa, and England. The eXpendable BathyThermograph (XBT) Science web pages provide easy access to XBT data, XBT-derived products, and other XBT-related scientific and operational information. The Ocean Currents Monitoring web pages present assessments of the spatial and temporal variability of velocity and transport of key oceans currents using expendable bathythermograph observations as the main data set. The Meridional Heat Transport (MHT) web pages provide quarterly reports for the North and South Atlantic MHT using data from the AX07 and AX18 expendable bathythermograph transects, respectively. The Temperature Sections web pages displays the location of all temperature profiles deployed along specified expendable bathythermograph transects, mean along-transect temperature sections and time their evolution at selected depths. 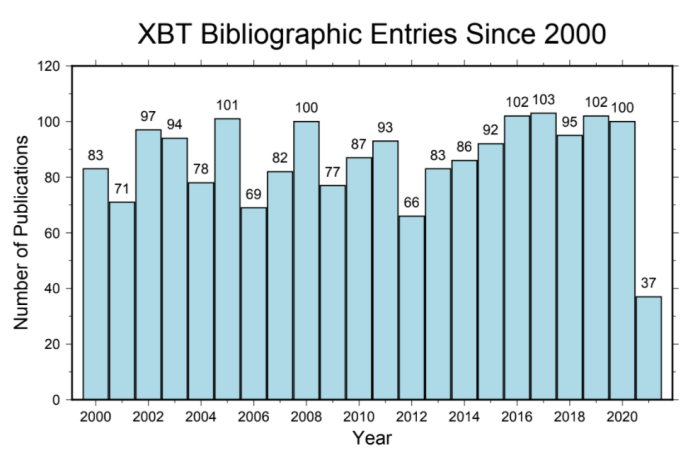 The Bibliography web page shows a list of scientific and technical publications that use since 2000 eXpendable BathyThermograph (XBT) data. The Oleander Project web pages highlight some of the results derived from expendable bathythermograph data obtained from the MV Oleander across the Gulf Stream. SEAS-AMVERSEAS is a software for real-time acquisition and transmission of environmental data that is employed on ships of the Ship Of Opportunity Program, University-National Oceanographic Laboratory System (UNOLS), and U.S. Coast Guard vessels. The Documents web pages provide the troubleshooting manuals for expendable bathythermograph transects, and setup and user guides created to assist in the installation, setup and operation of SEAS-AMVERSEAS system. Recent technical and scientific developments. Personnel involved in the operations and science.